Palästinensische Künstler und Kulturzentren feiern die 30jährige Pionierleistung von Darat al Funun in der arabischen und palästinensischen Kunstszene. 10. - 28. April 2018 in Jerusalem, Ramallah, Bethlehem, Gaza. Since the very beginning, when Suha Shoman launched her initiative in support of contemporary Arab artists in 1988, Darat al Funun strived to become Palestinian artists’ gateway to the rest of the world, while also providing a portal into Palestine for Arab artists. Over the course of 30 years, Darat al Funun played a pioneering role as a meeting point for artists, performers, researchers, writers and poets, who would present their work, share their expertise and experiences, and convey the reality of the Palestinian tragedy, epitomized by the occupation and its consequences, but also by the Palestinians’ resilience which disrupts the status quo. Darat al Funun has supported Palestinian arts and culture by organising art exhibitions, artist talks, workshops, performances and more. Its first exhibition in 1989 was for Armenian artist Paul Guiragossian, who lived in Jerusalem until the 1948 Nakba, after which he moved to Lebanon. It was followed by a solo exhibition for Jerusalemite artist Jumana El Husseini in 1991. In 1992, the exhibition of the "New Vision Group" brought together 7 artists who resisted the occupation during the first Intifada by boycotting Israeli goods, and using natural materials such as straw, clay and plant-based dyes as an alternative (Suleiman Mansour, Tayseer Barakat, Nabil Anani, Khalil Rabah, Jawad Al-Mahli, Yacoub Al-Kurd and Vera Tamari). That same year, an exhibition for three artists from Gaza was held, namely: Laila Shawa, Kamel al Mughanni and Fayez Al Hasani. At the opening of Darat al Funun in 1993, the performing arts were celebrated with a concert by soprano Tania Nasir, who sang poems in Arabic by Jabra Ibrahim Jabra, and was accompanied by pianist Agnes Bashir and modern ballet dancer Rania Qamhawi. Soon afterwards, Suha Shoman and her team organised solo exhibitions for Samia Halaby in 1995 and Kamal Boullata in 1998. They hosted the play "Lights of Jericho," based on Ghassan Kanafani’s "Men in the Sun," directed by Sawsan Darwazeh and performed by Samar Dudin (1995). They also presented a play titled “Al Zaroub,” based on al-Nakba stories by Samia Al Bakri from Akka. In addition to hosting exhibitions and performances, talks by prominent writers such as Jabra Ibrahim Jabra, Abdul Rahman Munif were held, as well as poetry recitals by father and son Mourid and Tamim Barghouthi. Despite the difficulty of traveling from and to Palestine, Darat al Funun maintained over the years a strong relationship with the Khalil Sakakini Cultural Center, under the direction of Adila Laïdi-Hanieh. The team worked closely together on the selection of artists upon launching the Darat al Funun Summer Academy, which was led by late artist Marwan Kassab-Bachi between 1999 and 2003. The Summer Academy brought together more than 60 Arab artists, including 15 artists from Gaza who then founded a new art scene back in their city and maintained artistic and personal relations with their teacher until his passing. Following this collaboration, Marwan donated his series of 99 prints entitled "Faces" to the Birzeit University Museum. Algerian artist Rachid Koraichi followed suit, donating L’Enfant Jazz series to the Khalil Sakakini Cultural Center. The collaboration with the Sakakini Center culminated in defying the siege imposed on the West Bank during the Al-Aqsa Intifada by holding the exhibition "100 Shaheed - 100 Lives," conceived by Adila Hanieh and curated by Samir Salameh. The idea was to break the mind-numbing anonymity of daily death counts, and to honour the families who must live the absence of their loved ones and the injustice of their parting. Darat al Funun continues to showcase Palestinian art and artists to this day. In 2006, the exhibition "The Wall and Checkpoints", featuring Emily Jacir, Dana Erekat, Rula Halawani, Tarek Al-Ghoussein and Rashid Masharawi, grappled with the apartheid wall and the checkpoints imposed by the Israeli occupation. Artist Mona Hatoum came for a residency that culminated in a solo exhibition in 2008. A solo exhibition was mounted for Basma AlSharif in 2009. That same year, twenty-seven artists paid tribute to Mahmoud Darwish and his poetry in an exhibition titled “Passport.” In 2010, we exhibited for the first time in the Arab world the work of Palestinian artist Ahlam Shibli, “Why did you leave the forest empty”, and in 2014 we had a solo exhibition for Nida Sinnokrot. In 2016, Darat al Funun participated in Qalandiya International, which for the first time since its inception widened its geographical outreach by inviting Palestinian institutions in the diaspora. Seven Palestinian artists residing in Amman were commissioned to create works for the exhibition “This Sea is Mine,” on the theme of the right of return. Artists in Jordan and Palestine communicated over Skype during the course of the program, and the exhibitions in Jerusalem and Amman were scheduled to open on the same day. In 2017, marking 100 years since the Balfour Declaration, 70 years since the 1947 UN resolution for the partition of Palestine, and 50 years since the 1967 Arab Israeli war that led to the occupation of the West Bank and Gaza, Darat al Funun dedicated its exhibition and events program to showcasing the Palestinian civilisation and cultural heritage throughout history under the title "Falastin al Hadara” (The Civilization of Palestine). Starting with archeological talks on the early settlements of Jericho in Palestine and Ain Ghazal in Jordan, the year-long program presented exhibitions on early Palestinian press and radio, and the art of Karimeh Abboud, the first Palestinian and Arab woman photographer. The exhibitions were accompanied by talks on the Khalidi library, established in 1900, and early Palestinian photography, writings, cinema and music. The Pioneers exhibition featured works by Nicolas Saig, who opened the first studio in Jerusalem in the thirties, and Zulfa al Sa’di, who received an award for her art at the 1933 First National Arab Fair. Paintings of Palestinian cities of Haifa, Akka and Jerusalem by 19th century European travellers from Hisham Al Khatib’s collection were also exhibited, and Palestinian dresses and embroidery dating back to the early twenties from the collection of Widad Kawar. The exhibitions were accompanied by storytelling by those who lived in Palestine before 1948. Contemporary Palestinian artists were also featured in the Falastin al Hadara exhibitions program. Khalid Hourani’s retrospective highlighted the refugee problem worldwide. In her animated film “The Memory of the Land,” Samira Badran powerfully enacted the hardships of the checkpoints crossing. Jumana Abboud engaged with cultural memory through a performance and a series of works entitled “The pomegranate and the sleeping ghoul,” inspired by Palestinian folktales featuring imaginary fantastical creatures and enchanted water springs. Today, on the occasion of Darat al Funun’s 30th anniversary, a program has been curated by artist Khaled Hourani from Ramallah in cooperation with Mohammad Shaqdih from Darat al Funun in Amman. The concept was to simultaneously run exhibitions and events in four Palestinian cities; Ramallah, Bethlehem, Jerusalem and Gaza. The program included art exhibitions, video film screenings, a display of Darat al Funun’s publications, and seminars. The artists from the “New Vision Group” revisited their 1992 exhibition and created new works that were shown at the Khalil Sakakini Cultural Center and Bab idDeir Art Gallery. Gaza-based artists from the Darat al Funun’s Summer Academy mounted an exhibition titled the “Impact of Transformations” in both Eltiqa and Shababeek galleries, which will also be shown at Bab idDeir in Bethlehem. Video films for Arab and Palestinian artists from the Khalid Shoman collection were screened. 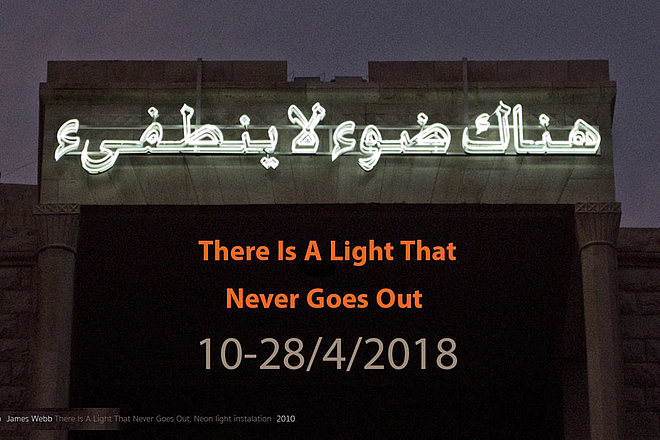 Amal Kenawy’s “Silence of Sheep”, Adel Abidin’s “Memorial”, Wael Shawky’s “Al Aqsa Park”, and Hrair Sarkissian’s “Homesick” were shown at the Khalil Sakakini Cultural Center. Bab idDeir Art Gallery exhibited Jumana Abboud’s “Smuggling Lemons”, Wael Shawky’s “Al Aqsa Park” and Mona Hatoum’s “So Much I Want to Say”. Al Hoash Gallery presented Basma Alsharif’s “We Began by Measuring Distance”, Suha Shoman’s “Bayyaritna”, and Moataz Nasr’s “The Echo”. Finally, following the opening at the Khalil Sakakini Center, the film “Our Story” on the journey of Darat al Funun was screened. A seminar ensued with speakers who remembered and told stories of their years-long relationship and friendship with Darat al Funun, which continues to this day: Adila Laïdi-Hanieh recently published a seminal book on modernist artist Fahrelnissa Zeid, Suha Shoman’s teacher and mentor; Emily Jacir has recently held her very first retrospective at Darat al Funun, followed by a retrospective for Khaled Hourani; Tania Nasir, who performed at the inauguration of Darat al Funun will be singing with her niece, the soprano Mariam Tamari at the closing ceremony of our 30th anniversary, symbolizing the spirit of continuity from generation to generation. Programm kuratiert vom Künstler Khaled Hourani aus Ramallah in Kooperation mit Mohammad Shaqdih von Darat al Funun in Amman.